Formerly, the majority of women, and of course men, have loved her for the sassy and stylish character, Rachel, who she played in the Suits series, though we have fallen further in love with her presence, perseverance and real passion for change since being appointed into the royal family. Megan has always illustrated incredible style, showcasing Australian designers such as Toni Maticevski, Camilla and Marc and Dion Lee pieces just to name a few. Her personal style is represented in simplistic, structured and classic choices which she has carried through her pregnancy. Being in the spotlight is never easy for any celebrity, especially in the early stages of pregnancy. 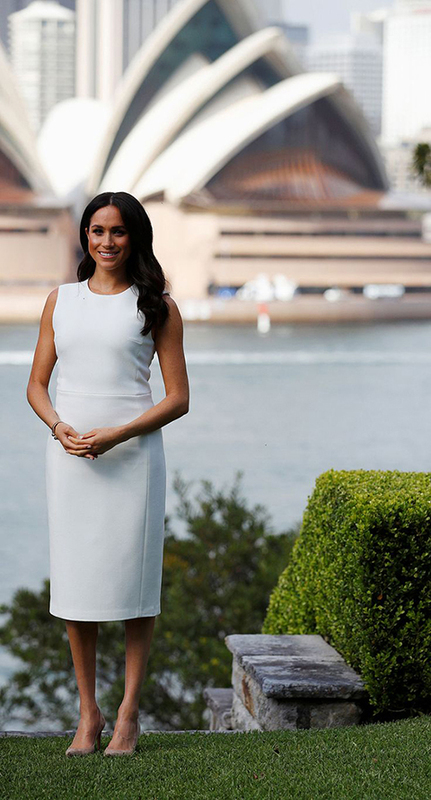 This image below was the first official outing since announcing the pregnancy and Megan looked every bit fresh in a gorgeous white classic styled dress. 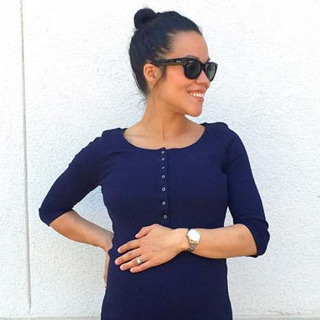 As a personal stylist, I advise my clients when looking at garments for your pregnancy to still maintain the presence of your own personal style in your outfits. In the early stages introducing your pregnancy subtly through your everyday style can be achieved by structured outfits that allow you to maintain length in your body shape though still tailored enough to streamline the proportions. This style dress allows you to create those streamlined proportions with a long line hem and a structured feel being all one colour. Even though the fabric is a stretch this will allow you to have a piece like this in your wardrobe to by utitlised throughout your pregnancy. A gorgeous addition to any women’s wardrobe is a collared button down shirt dress with an A line silhouette. 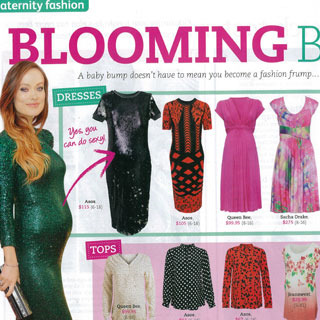 This is especially flattering throughout your pregnancy as it allows the creation of proportions though also as Megan has worn hers, the tie sits above the bump which cinches in the smallest part of her torso – under the bust and above the bump. The Seraphine Chambray dress is a similar style and carries the same characteristics as the one worn by Megan. The chambray fabric is cool, yet versatile allowing it to be dressed up with wedges, espadrilles or simply worn with sandals. As you transition into the later part of your pregnancy this can also be worn open as a layering piece to create more length as illustrated next. Creating length in your outfits allows the onlookers eye to have an overall flattering feeling to someone’s personal style. By being conscious of this fact, especially in the later stages of your pregnancy when you are really showing, allows you to be able to visually experiment with different pieces. As shown here, Megan has incorporated the use of colour blocking and layering to create more length. Having a solid colour figure hugging dress under a jacket or vest layer allows definition around the shape of the bump though gives a slimline basis under the layers that you are adding on top. In this instance you could experience with a block colour dress as shown on the Irene tank dress and similarly layer a long line vest similar to the Dalius vest. Being mindful of the climate and time of year, the layering piece can be patterned, a lighter or flowy fabric or similarly can be made up of warmer materials. The long line of the vest or jacket draws the eye vertically up and down the body allowing it to compliment the bump. For further information on how you can book in for a Style Discovery session to chat further about your personal style and establishing a wardrobe to allow you to transition your style seamlessly throughout your pregnancy.